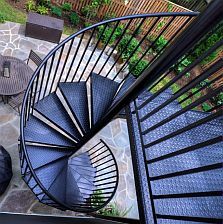 For over thirty years, Stairways Inc. has designed, produced, and delivered metal spiral staircases and metal spiral stair kits to commercial, industrial and residential clients throughout the United States as well as worldwide. 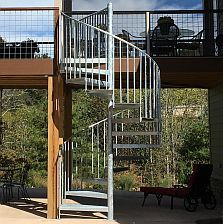 Metal spiral staircase kits from Stairways Inc. are available in stainless steel, marine grade aluminum and galvanized steel versions. Other options, such as wood handrails or wood treads (or both) are available with other metal components. In other words, you, as the client, can mix and match to customize for your specific tastes. Stairways Inc. standard metal spiral staircase kits in galvanized steel are delivered ready to assemble in a red oxide primer finish. Metal spiral stair kits are available in three finishes, including a Number 4 brushed finish, a Number 7 mirror finish and a mill finish. Metal spiral staircase kits meet UBC (Uniform Building Code) and BOCA (Building Officials and Code Administrators International, Inc.) codes; we recommend you check with your local building department or local building inspector before ordering a Stairways Inc. metal spiral stair kit. 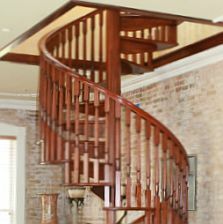 Standard metal spiral stair kits also feature a ten-inch square, one-quarter inch thick metal base plate; eleven (11) 3/4" steel balusters; a 3.5" outer diameter column; a 36" tall landing rail complete with 3/4" balusters; eleven (11) 12-gauge smooth steel treads, a length of 1 and 1/4" black vinyl handrail; and a complete set of fasteners and step-by-step instructions. Steel and aluminum standard metal spiral staircase kits range in diameters from 40" to 72"; tread sizes from 18" to 34"; and landing sizes from 21" to 37". 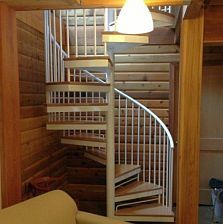 Steel standard metal spiral stair kits weigh from 270 pounds to 360 pounds, and aluminum metal spiral staircase kits weigh from 135 pounds to 190 pounds. Having successfully met the specifications of thirty-plus years' worth of customers with a wide array of metal spiral staircase kits, Stairways Inc. is ready and willing to meet your delivery requirements for standard and custom metal spiral stair kits. Call the staff here at Stairways Inc. for all your metal spiral staircase kit needs! BOCA and UBC codes require a minimum 60" diameter (64" wood) with 30° treads and a 4 inch baluster spacing. Before ordering, check with your local building inspector for your code requirements. Installation: Our circular Kit Stair systems come in a box with instructions and can be installed by two people in less than a day without the need for any special tools or expensive equipment.